Lately, I’ve been wondering why we can’t seem to get enough of dystopia? I don’t need to recount all the ways in which the world’s a mess, but it’s intriguing that just about every tentpole movie (from Edge of Tomorrow to Transformers: Age of Extinction to The Hunger Games) mires itself in the gloomiest possible vision of a future we once saw as endlessly bright — or at least that’s the story we tell ourselves about the past. TV, of course, has joined the vigorous march toward doom. This week, I watched the opening episode of HBO’s The Leftovers, which (happily) is not another cooking show. The jury may be out on the show’s merits, but it brings dystopian flavor to a present in which a third of the population has vanished — for no apparent reason. The great disappearance seems to have resulted in a thorough demoralization of those who remain, the leftovers of the title. That show airs at the same time as The Last Ship, a TNT production about the lone surviving naval ship in a world vanquished by a plague-like virus. As a culture, we seem to be wallowing in mass depression — and even if the box office has flagged a bit — we seem to be enjoying our gloom immensely. Me? I’ve grown weary of the dystopian thinking that has burdened the artistic imagination. But maybe even that attitude reflects the general malaise. What the hell’s wrong with me? I’m having trouble enjoying mass destruction. Now comes Snowpiercer, an international hybrid of a movie from Korean director Bong Joon-ho (The Host), and it may help restore my faith in hopelessness. Perhaps because its director is Korean and perhaps because Bong bases his movie on a French graphic novel called Le Transperceneige, Snowpiercer has become an art-house offering. Don’t be misled. Snowpiercer is an action movie wrapped in an iron-clad vision of a society in which survival depends on brutally enforced class divisions that may have resulted from an intense competition for limited resources. Bong’s refreshingly preposterous movie takes place on a train that circles the globe. The lives of those on board are maintained, but the train goes nowhere. The whole idea of destinations seem to have vanished. How did this happen? Global warming was heating the planet to intolerable levels. Someone figured out how to cool the planet, but the solution went too far, turning the entire Earth into a snow-covered wasteland. The only survivors are on the train to nowhere, lurching endlessly through sub-zero temperatures. As can happen when a group is totally suppressed, the lower classes who occupy the rear of the train are becoming restless. Curtis (Chris Evans) and his friend Edgar (Jamie Bell) decide it’s time for a revolt. This means organizing their fellow sufferers and fighting their way to the front of the train, where people haven’t been reduced to living in squalor and eating nothing but protein bars that look as if they’re made from a combination of recycled rubber and gummy bears (they’re not). A mysterious figure we don’t see until the film’s final act presides over the train and its regimented inhabitants. Bong creates plenty of excitement as the rebels attempt to traverse the train’s length, exposing the train’s social structure as they go, and pouring on plenty of revolutionary violence. Bong obtains fine performances from a cast that includes Octavia Spencer as the mother of a boy who’s taken to the front of the train for unknown reasons, and John Hurt, as a sagacious old man who became a peon when he was banished from the front of the train. 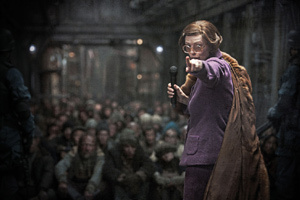 We also meet Mason (an unrecognizable Tilda Swinton), a bureaucrat who travels the length of the train making announcements for the purportedly revered leader and doling out punishments to those who express dissatisfaction. Alison Pill has a wonderfully exuberant turn as a school teacher who instructs young people and who also leads them in insanely cheerful devotions to the unseen leader. Korean actors Kang-ho Song and Ah-sung Ko, play a father/daughter team of drug addicts who join the fray. Intricately realized and totally unhinged, Snowpierecer can’t be watched without feeling a bit of trepidation, probably because much depends on what happens when our revolutionaries finally reach the front of the train, where actor Ed Harris becomes a presence. It pains me to say that the finale is a bit of a letdown. How could it not be? Harris doles out bits of expositional and philosophical dialogue that don’t quite deliver the hoped-for payoff. But don’t let that stop you from seeing one of the most creative, strange and propulsive movie’s of the year. Flaws and all, Snowpiercer — like its perpetually moving train — takes us on one hell of a trip.